At Motek 2017 (Hall 7, stand 7420), Omron is presenting holistic automation solutions from a single source that allow manufacturing companies to achieve sustainable process optimizations in the fields of handling, intralogistics, and manufacturing. Omron's "i-Automation" concept represents intelligent, integrated, and interactive solutions that unlock untapped potential in terms of productivity and quality in industrial processes. Its key focus is interoperable solutions that facilitate the digitalization of manufacturing in the context of Industry 4.0. 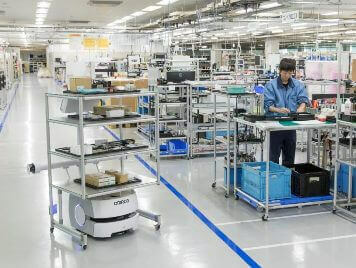 Omron is combining robot-based assembly automation with high-performance industrial automation under one roof. Engineering and production processes can be further optimized thanks to the flexible robot system with integrated image processing, especially when used as a complete handling system with an integrated feeding system. At Omron's stand, visitors will be able to see a unique combination of SCARA robots, feeding solutions, and image processing systems in conjunction with a controller, as well as safety components and unique NJ series machine automation controllers. The autonomous, driverless transport systems in the LD series are enabling Omron to also make advances in the field of intralogistics in the context of the fourth industrial revolution. Thanks to integrated navigation and movement controllers plus software-based map generation, the mobile robots navigate a defined work space completely autonomously and in a safe manner — without the need for specialized infrastructure. Visitors to Omron's stand at Motek will be able to experience just how simple it is to commission the intelligent vehicles, as well as their interactive abilities as have been proven in field tests. Omron is also showcasing an innovation in the field of image processing: The new Xpectia vision systems provide a range of high-resolution and rapid cameras and IPCs for a wide scope of applications, from standard tasks such as inspections right through to complex and high-speed applications. Featuring properties such as traceability, serialization, and the ability to exchange data, these camera systems can be integrated seamlessly into a functional Industry 4.0 infrastructure. Omron's scalable automation platform, Sysmac, integrates all systems into a single high-performance control environment. Its design is based on EtherCAT and aims to meet even the highest requirements, as well as providing real-time control in networked manufacturing systems within the meaning of Industry 4.0. Thanks to the integrated and comprehensive Sysmac Studio software, components can be integrated or replaced quickly. Sysmac enables productivity and efficiency to increase in a variety of scenarios, from classic machine automation right through to high-performance industry PCs in smart factories.